Dr. Marc S. Wright has been successfully providing quality orthodontic care to Northern Georgia residents for many years. 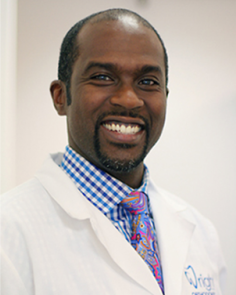 He received his bachelor’s degree in Chemistry with honors from the University of the West Indies, Kingston, Jamaica, before attending Howard University College of Dentistry in Washington, D.C. where he received his Doctorate of Dental Surgery. Dr. Wright was highly recognized during his graduate studies for his outstanding proficiency in dentistry and received the highest recognition in all other disciplines of dentistry such as restorative dentistry, where he showed commendable performance in both theoretical examinations and in clinical performance. He was also presented with the certificate of merit, given by Teledyne Water Pik, for outstanding proficiency in prosthodontics. Dr. Wright was awarded with the coveted Dr. Merton Vu Ducket Award, which was granted to the senior student who consistently exhibited a professional code of ethics, humanitarianism, exemplary character and devotion to the College and the profession of Dentistry. He was granted an alumni membership into the National Dental Honors Society – Omicron Kappa Upsilon, he received the Dean’s Award for his superior academic achievement and excellence in clinical skills, and the National Dental Association Award, among seven other Awards for his achievements. He then continued his 2 year post-graduate specialty in Orthodontics and Dentofacial Orthopedics at Howard University. He frequently attends continuing education programs assuring that he remains at the forefront of Orthodontics. Dr. Wright is also a trained certified SureSmile® Orthodontist. SureSmile® is the latest innovation in Orthodontic treatment where the doctor uses advanced 3-D imaging, virtual simulations, and robotically bent arch wires customized for treatment.